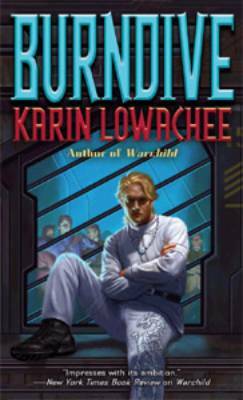 Burndive is the sequel to Karin Lowachee’s award winning first novel War Child. Karin Lowachee has been nominated for the John W. Campbell award for Best New Writer. This story follows young Ryan Azarcon, son of a well-known starship captain and grandson of an equally well know diplomat, both from the first novel. A combination of wealth, fame and intrusive branches of the media, leaves Ryan in a state where privacy is his most precious commodity. The advanced technology available to the techno-paparazzi and factoid addicts in Burndive, manage to make things even worse for Ryan than things often are for current-day real-life celebrities. Violence, possibly related to past and current warfare, leads to Ryan’s father returning and taking him along on the military craft that his father is stationed on. As Ryan sees events of the day directly, he comes to realize that portrayals of celebrity’s lives aren’t the only things, that are often inaccurately portrayed by some aspects of the media. Burn Dive is a good novel for those who enjoy character-driven fiction. Originally published in issue 3 of Neo-opsis.